Do you crave a snack during the day that will give you energy, boost your immunity and have your skin glowing from the inside out?! 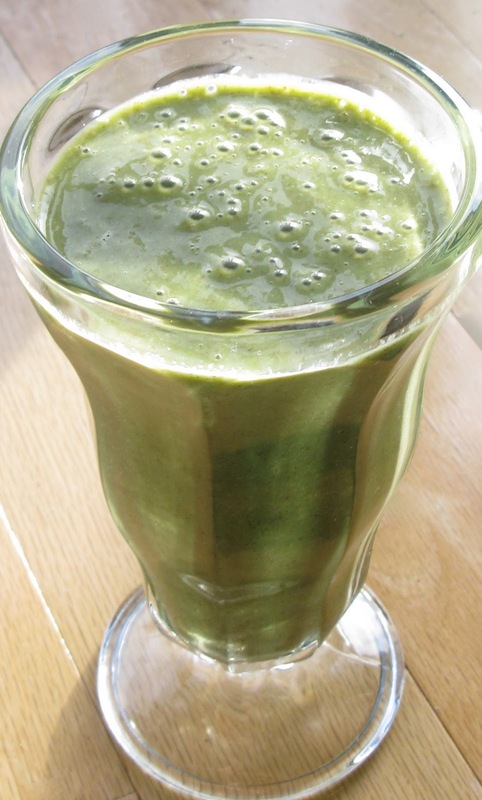 Look no further…I present you with The Green Chia Smoothie! 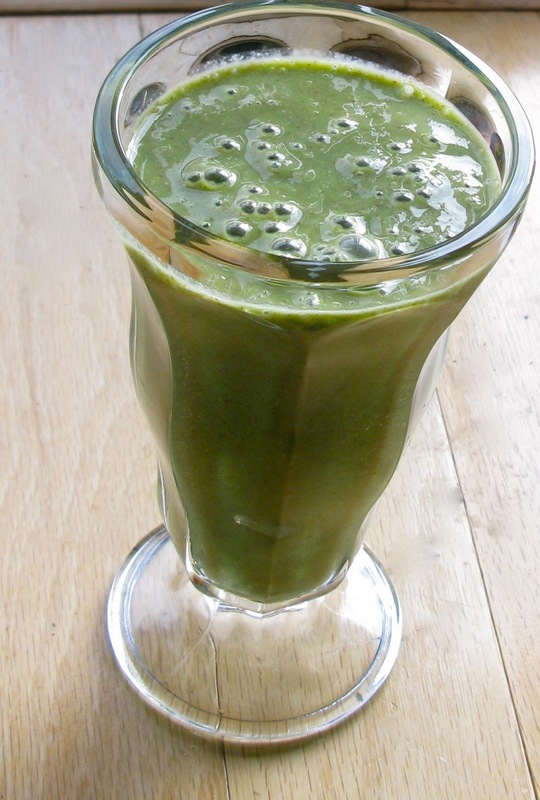 Three of my favorite superfoods are in this drink: Kale, chia seeds and raw honey. Kale, my favorite green leafy vegetable, has a rocking nutritional profile. This cruciferous vegetable is loaded with Vitamins A, C, E, K, calcium, fiber, iron and manganese. Strawberries are also an amazing source of Vitamin C and contain numerous antioxidants. Chia seeds are incredibly rich in Omega 3 fatty acids and fiber. Chia seeds are known to help regulate blood sugar. Their high fiber content also helps to keep you full longer. Raw honey is anti-bacterial and anti-viral and adds the perfect slightly sweetened taste to this smoothie. So take a few minutes today to take care of yourself and drink up this heart healthy smoothie! Blend on high for 2 minutes. Pour into glasses and enjoy. Cheers to radiant health! Note: If you want to sweeten the drink more, you can add 1 additional Tbsp. of raw honey prior to blending and/or 1 tsp. cinnamon. This recipe was shared on Friday Food, This Week’s Cravings, Thriving on Thursdays, Sunday School, Whole Food Wednesdays, Superfood Sunday Blog Carnival, Hearth and Soul Hop, Traditional Tuesdays, Slightly Indulgent Tuesday, Fat Tuesday, Real Food 101, Make Ahead Monday, Fight Back Friday, Friday Food Flicks, Fresh Bites Friday, Freaky Friday, Simple Lives Thursday, Pennywise Platter Thursday, WLWW, Healthy 2 Day Wednesday, Frugal Days, Sustainable Ways, Real Food Wednesday, Allergy-Free Wednesdays, Gluten-Free Wednesdays, Seasonal Celebration Sunday and Tuesday Time Out. This smoothie looks delicious! I'm trying to drink more green smoothies, they are soo healthy! Love the ingredients in this, I'll have to try it! Annie, good for you for drinking more green smoothies! They are so wonderful for you! Amber, Great minds think alike, if I do say so myself 🙂 It really is wonderful to be inspired by you wonderful Ladies. I will be honest, I've NEVER had a green smoothie because we always just eat our greens. I think this looks awesome and will surely try it! Yum! This looks great! Smoothies are so good, filling and quick!! Great recipe! The green color weirds me out a little bit, but I've been wanting to try a green smoothie for so long! At least the ingredients sound yummy! Heather, I know the green color takes a little getting used to, but it just means you are giving your body a major dose of vitamins and minerals! Yummy – bet this would be great with coconut water as well! I'm going to have to make this ASAP. I love chia seeds and feel a cold coming on. I think this is just what I need 🙂 Thanks! Looks so yummy! Thanks for sharing w/ Healthy 2Day Wednesday! Hope to see you back next week! Pinning this! I would love for you to come share this post on my link-up, Make-ahead Mondays, at Raising Isabella! This looks so good, and would be a fantastic superfood for pregnancy and breastfeeding. Would you be willing to share this on my blog carnival, superfood sundays? My granddaughter is the smoothie person around here and she makes some great ones, usually adding spinach. I should give her those chia seeds sitting in my freezer so she can make me that healthy looking drink of yours. Thank you so much. You can replace kale with spinach–or use both 🙂 Hopefully you both can use those chia seeds and get a chance to enjoy the smoothie! I have a big beautiful bag of chia seeds in my fridge just waiting for me to make this. It sounds delicious. Thank you for sharing it with us at Whole Food Wednesdays and have a great rest of your week. YUM! 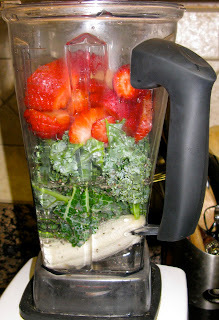 I made a smoothie with kale and berries this weekend and my daughter said it tasted "like a crushed vitamin". I decided that meant I didn't have to share. 🙂 I picked up chia seeds this weekend and am looking forward to trying them in a smoothie.